Right, on to today's post! 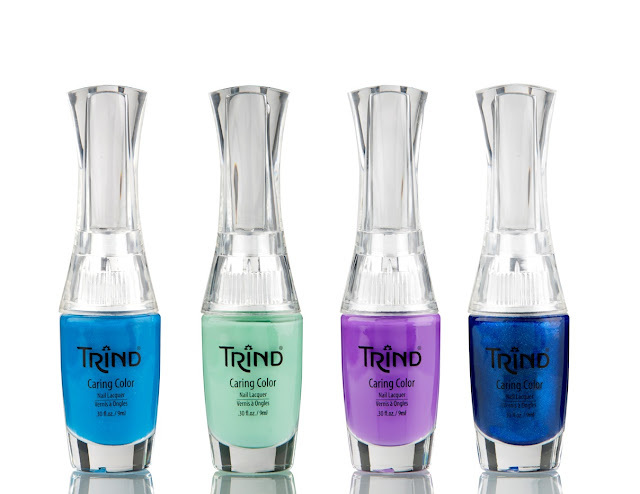 Trind send me their Paradise Island collection, which consists of 4 polishes, 2 cremes and 2 shimmers. I mainly know Trind for their wide range of nail care products, and I liked the products that I tried of them, so I was curious after these polishes. They are from their Caring Colors line, those polishes are developed to maintain your pretty nails. Now I don't know how well they do that, because I just swatched them, but I do know I liked their application! Each polish took 2 easy, streak-free coats (or 3, if you prefer thinner coats) and I just love streak-free cremes! I applied the 2nd coat thicker, but even with a thicker coat these dried surprisingly fast. They're shiny as well, I didn't use top coat for my swatches. The brush of these polishes is fairly small, especially compared to the wider brushes that seem more common nowadays. But I don't mind smaller brushes, it takes more strokes to cover the nail, but I find it easier to polish neatly around my cuticles and that helps with the cleanup afterwards. Minty Mojito is a bright mint green. I have quite a few minty greens, but I think it is actually unique in my stash because it's brighter than similar polishes (I haven't doublechecked on nail wheels because I ran out of them and am waiting for my swatch sticks). Unfortunately it does give me red fingers aka lobster hands. Purple Sunset is a red-based purple and was the most pigmented of the bunch. My camera shows it too blue though (heh, now there's a surprise! ), so I used my phone in an attempt to capture the color better, as you can see below. 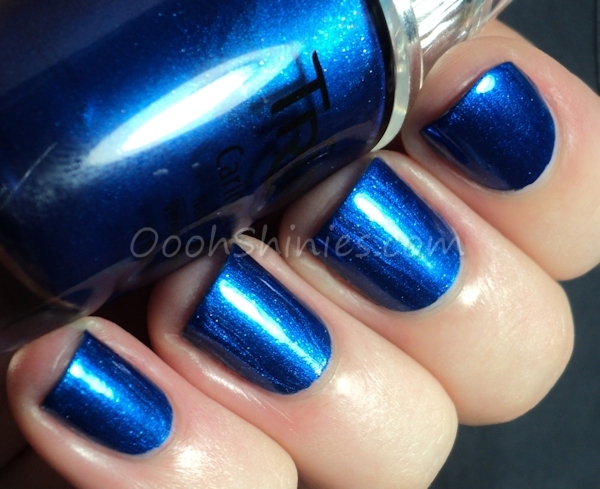 Tropical Blue is a cobalt blue shimmer, and it's a beauty, look at that shimmer! I like this one most on my photos, but in real life, it's Blue Lagoon that wins the race. If you want to see their whole line of colors, have a look here. If you're not sure where you can buy Trind products, have a look here and select your country for more information.